-Grande Indietro balcone con vista sul palme e piscina rilassante. -Open Concetto di soggiorno e cucina con un sacco di luce naturale. -PACK N Play e seggiolone. -entro 1-2 ore dagli splendidi paesaggi della Zions Canyon e il Festival shakespeariano a Cedar City. Ci piace la zona di San Giorgio, e sappiamo che vi piacerà questo condominio. Questo è il perfetto rifugio per la vostra famiglia, un week-end con gli amici, o coppie ritirata. The place was comfy, cozy, warm, and super awesome! We especially loved all the suggestions of things to do nearby. Perfect condo for a getaway in St George!! We had such a great time at this condo! It is in great condition, great amenities and the owners were so easy to work with! We will definitely be back! Great well equipped condo. Comfortable, clean, and nice view. Complex had lots of amentities for families. Close by to lots of golf. A great place to stay for summer activities. Would love to return when it's warmer and NO snow on the ground. Have to say the snow on the palm trees was beautiful!! 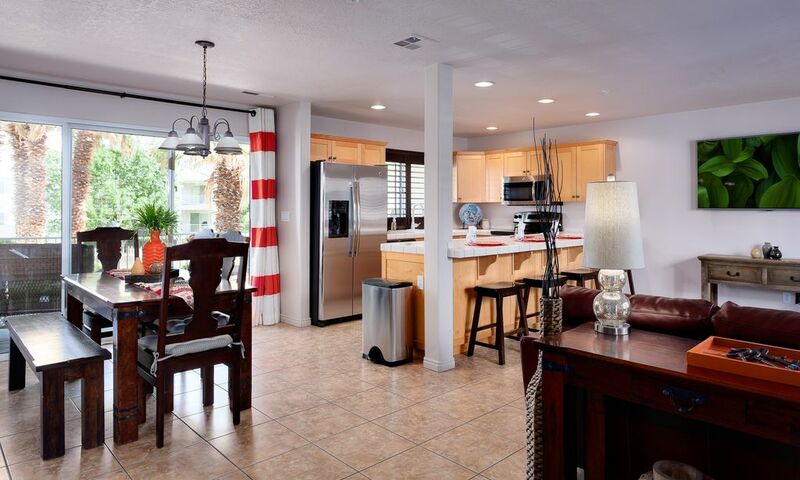 This property has been upgraded with nice beds, couches, and appliances. The kitchen is stocked better than most properties we've stayed in. The two bedrooms and bathrooms gave us plenty of space and the pool/palm tree view from the balcony is fabulous! We would stay here again. We had a wonderful stay and Claudia was so accomadating. Place is clean and beds are comfortable. We will definitely be back.